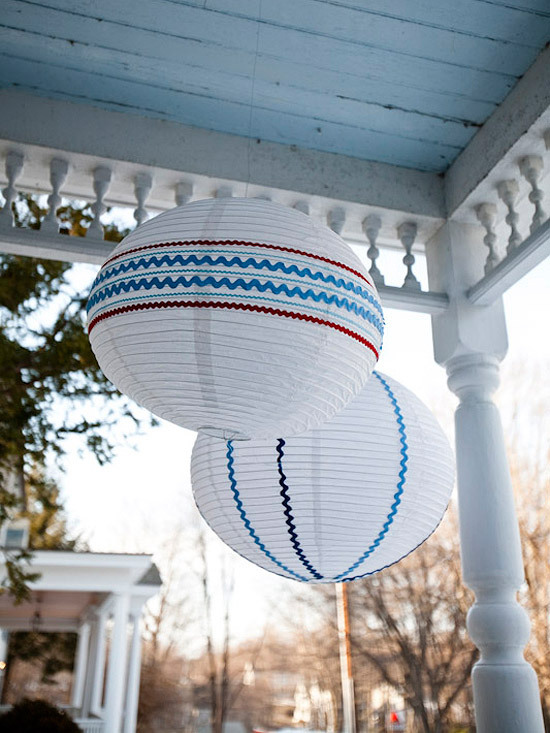 Dress up your home in the spirit of Independence Day. 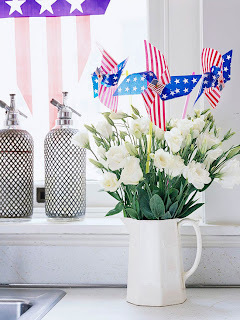 Put together these easy red, white, and blue Fourth of July decorations to make your festivities sparkle. Show your American pride with these colorful letters. 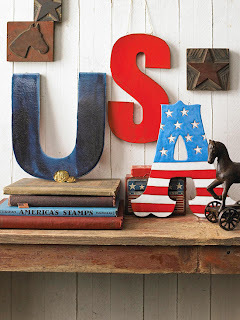 Buy plain wooden letters (available at crafts stores) and get creative with red, white, and blue acrylic paint. 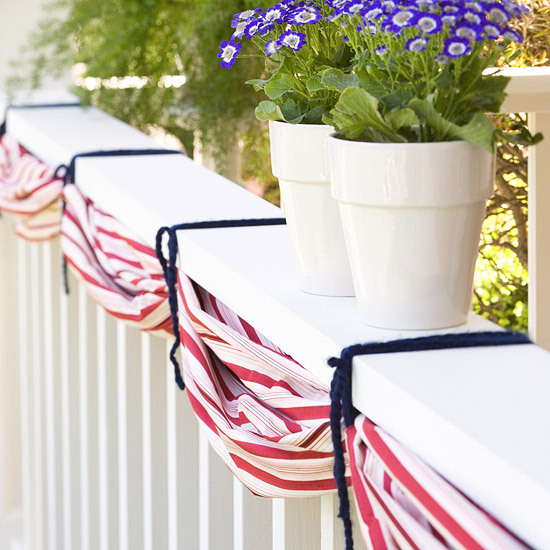 Mix and match solid colors with stars and stripes. Coat the letters with polyurethane for durability. 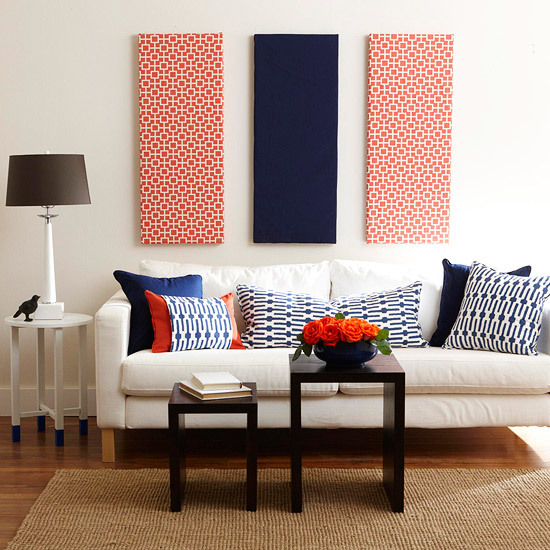 Create fun blocks of color to bring patriotic spirit to any room. Cover three plywood boards with red, white, and blue fabric. Using tacks or staples, secure the ends of the fabric in the back. Drill wall hooks into the back of each board for hanging. Tip: Change the fabric with the seasons and holidays. 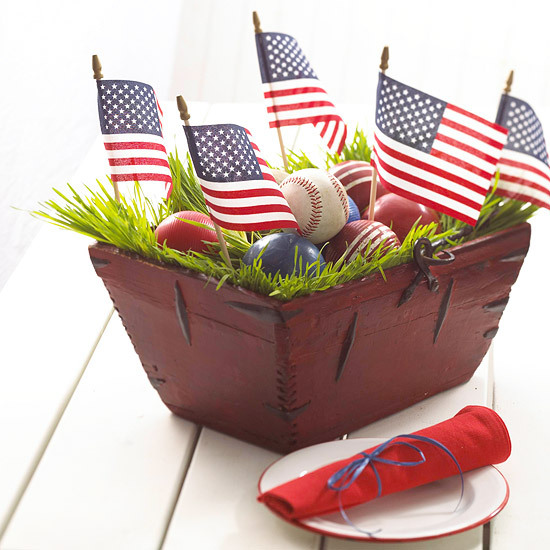 Show off pride for our country with this adorable and delectable centerpiece. In honor of the date, display a metal 4 house number inside a vase filled with holiday-color candies. 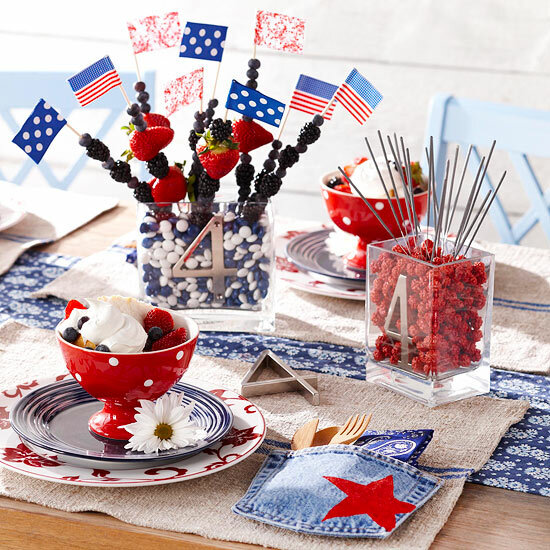 Insert classic sparklers or berry skewers decorated with colorful ribbon flags. For fun Fourth of July place settings, use denim pockets to contain silverware. Cut denim pockets from worn-out jeans and set to the right of each place setting. To emphasize the patriotic scheme, stencil a bright red star on each pocket. Add a bandana napkin and utensils. You can pull together this patriotic decoration in a jiff. Just fill an open chest or basket with decorative green grass, baseballs, and red and blue croquet balls. Top it off with a few tiny flags. 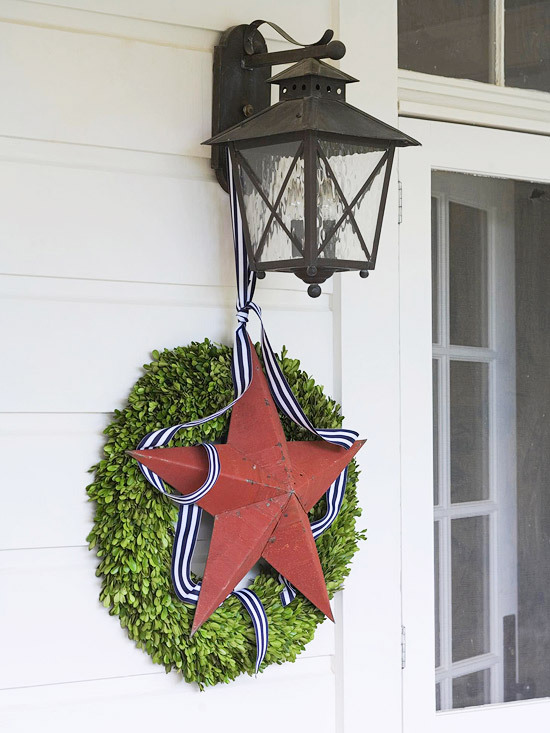 Make a bold patriotic statement by sprucing up your front door with a ribbon-wrapped star. Loosely tie a ribbon around a metal star and loop the ribbon around a hook or outdoor light fixture; secure with a knot. Make the star the center focus by hanging a wreath behind it. 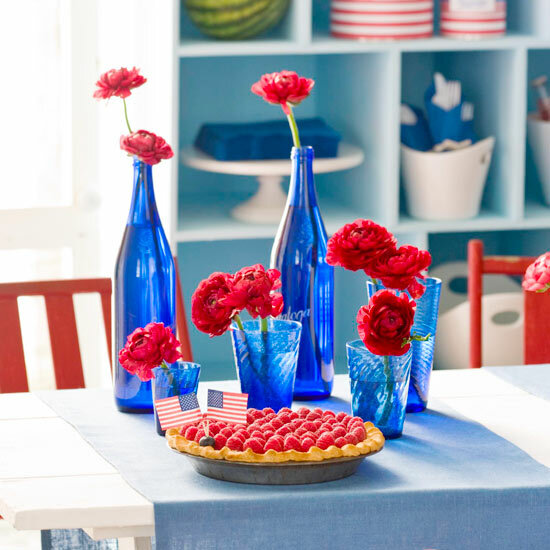 A collection of blue bottles and drinking glasses makes a charming Fourth of July centerpiece, especially when filled with flags or red flowers, such as these peonies. A blue table runner ties the look together. 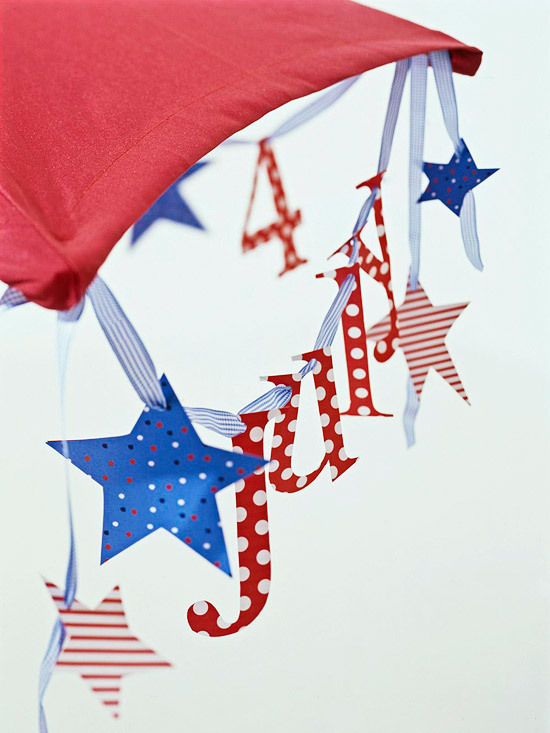 Make your own bunting for the Fourth of July. 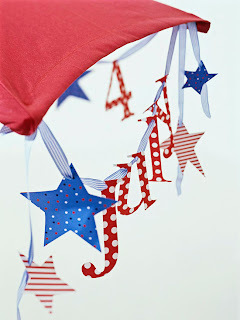 Buy several yards of patriotic-patterned fabric (determine length based on where the bunting will hang). Starting at one end, gather the fabric about every 24 inches and secure the gathers with red, white, or blue yarn. Use the same color of yarn to attach the fabric where desired. Add some patriotism to your porch by putting red, white, blue pinwheels into rustic buckets and watering cans filled with sand. This festive banner can be hung anywhere. Type "July" on your computer and enlarge the font to desired size. Print and cut out the letters to use as patterns. Trace and cut out mirror pairs of letters from red, white, and blue patterned paper. Cut out pairs of stars in various sizes, too. Glue each pair with patterned sides facing out. Once dry, punch holes in the cutouts and string on a ribbon. Illuminate the outdoors with these festive porch decorations. Simply glue assorted blue and red ribbon and rick rack on plain white lanterns available at your local home decor store. 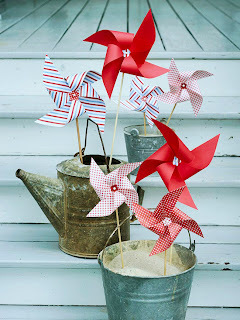 Give a handful of plain white blooms a patriotic attitude by poking in some stars-and-stripes pinwheels.